Our science curriculum this year for my daughter seemed to be more tedious than ever. 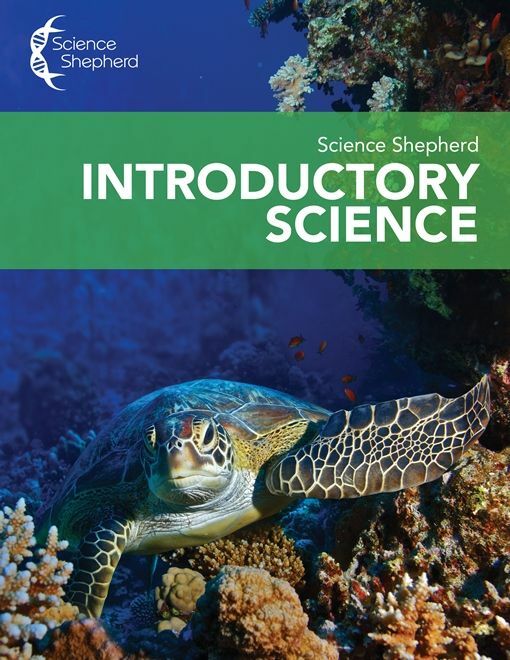 So when I heard of this homeschool science curriculum, Introductory Science from Science Shepherd, we were excited to begin. Introductory Science offers 35 weeks of science curriculum. Each week except week 35 contains 5 videos/lessons and sometimes an additional activity video is included. All of those videos are found online where you will be given log in information to access. The curriculum also includes a spiral bound student workbook. There are 2 levels available - Level A is approximately for ages 6-8 and Level B is approximately for ages 9-11. There is also a answer key available for each level. We reviewed the Level B answer key and workbook which included 383 pages of simple daily lessons to complement the videos. This program was developed by homeschool dad, Scott Hardin, who saw the need for quality higher level science curriculum for the homeschool community. They offer courses for middle school and Biology for high school as well. Weeks 1 & 2 are introduction weeks introducing you creation where you will learn the days of creation. All lessons are taught from a Biblical worldview. Week 3 introduces you to science skills and tools. Weeks 4-10 & 14-15 cover earth science topics including meteorology, geology, oceanography, and astronomy. Weeks 30-35 cover physical science topics including matter, energy, motion, and magnets. So, as you can see by the topics discussed this is a very thorough and complete science curriculum. It is a great introductory course for science. The lessons are taught in a simplistic style that made them enjoyable for my daughter and easier for her to retain what she was learning. As a matter of fact, she loved Science Shepherd! Many of the curriculum choices we have used in the past have been heavy on reading. Well, when all your other subjects are heavy on reading as well, the last subject you do usually becomes the most tedious one and for us that was often science. Although I would often help out with the reading portion, I could tell that she needed to make a switch. What a blessing Science Shepherd has been for our family! Again, the lessons are taught by video instruction which cut out all the reading for us both. Each lesson has a workbook page that you complete as well. 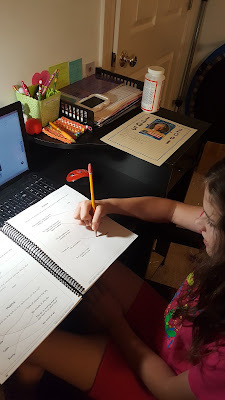 She really enjoyed the workbook lessons which included crossword puzzles, fill in the blank, matching, and circling correct answers. We could complete each lesson in less than 20 minutes a day which was a great plus too! Scattered throughout the lessons were also simple activities. Some of the ones we completed were drawing each of the days of creation, making a list of things that a parent has given you dominion over and how you can take care of those, feeling and observing objects in a bag, classifying paper flowers by petals and color. All of the activities are quick to complete and use household items, no items at all, or a given page in the workbook - for instance there was a worksheet provided for the flowers. There is also a supply list for those who like to plan ahead. We have not completed all of the week yet and are currently taking a little "summer" break but we do intend to pick this back up where we left off. Since it includes a 12 month subscription, that allows plenty of time for you to complete the course and take breaks when needed. If for some reason you do need an extension, that option is available up to 3 additional months for $5 each. I am also seriously considering purchasing the Biology course for my 10th grader for next school year as well. I can't wait to see what my fellow crew members thought about it. Be sure to check out the samples to see if this curriculum might be just what you are looking for. We also thought the price was very reasonable for the content provided. The Introductory Science video course can be purchased for $35. Level A workbook costs $12 and Level B workbook costs $15. The answer keys are $3.